How Risky Is Calumet Specialty Products Partners, L.P? Looking at the balance sheet, pretty darn risky. It doesn't take a stock picking genius to see that refiner Calumet Specialty Products Partners' (NASDAQ:CLMT) stock is a pretty risky one. In 2016 alone, shares are down more than two thirds as Wall Street has been justifiably freaked out by its balance sheet. Let's take a look at what makes Calumet's stock still risky today, what the company is doing to fix the situation, and how investors should view this stock in the meantime. So much of the risk at Calumet has been built up over the past several years. Starting in 2011, management went on a shopping spree where it purchased three refineries as well as an oilfield services company. It should also be noted that the three refineries that Calumet purchased were traditional fuel refineries -- producing gasoline and diesel -- rather than its wheelhouse of specialty petroleum products like lubricants, solvents, and waxes. To fund all of these purchases, the company loaded itself up with loads of debt under the guise that it would "grow into its balance sheet." For a year or two, management might have been able to say that. Unfortunately, though, one thing that Calumet's management seemed to have forgot is that refining traditional fuels and oilfield services are much more cyclical businesses than specialty products. So when these segments stopped producing at high rates, it completely sapped the company's profitability. So much for growing into that balance sheet. CLMT Total Long Term Debt (Annual) data by YCharts. Another aspect that made this so challenging for Calumet is the fact that it was paying out such a huge distribution to shareholders that was completely unsustainable for years. Every time that Calumet paid out more in distributions than its distributable cash flow brought in that quarter, it was tapping some sort of debt to finance it. In 2015, it looked as though things might be looking a little better, but that was at a time when refining margins were at very high rates and not something that any investor should count on. When you see metrics like that, it's pretty easy to see why new CEO Timothy Go made the decision to suspend the distribution earlier this year. Ultimately, though, the confluence of these factors has put the company in a financial bind. 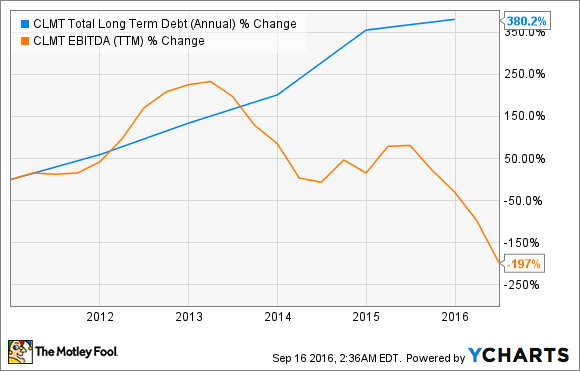 Today, the company's debt to capital ratio stands at 85% and its net debt to EBITDA ratio is a ghastly 12 times. Just to give you an idea of how risky creditors consider this company, its most recent debt issuance came with an 11% coupon rate. That's its debt, mind you, so imagine the risk that its equity investors are taking on. CEO Go is not in an enviable position. He somehow needs to turn this company around and return it to a level of profitability that will allow it to pay down its debts and hopefully get back to paying a distribution to shareholders. Based on the plan that Go has put forward, it looks like it could work. He wants to minimize capital spending and focus that spending on improving operations at existing facilities that will increase returns. One example of this is to increase Calumet's ability to run heavy Canadian crude oil. This oil typically sells for a pretty hefty discount to other crudes even when you consider the higher transportation costs. This, in turn should help improve returns across its specialty products and traditional fuels refineries. Image source: Calumet Specialty Products Partners. Another aspect of Go's plan is to cut ties with poorly performing assets. The company recently sold its interest in a new diesel refinery in North Dakota it was developing because its long term prospects were looking rather dismal. The refinery was designed when drilling in the Bakken shale region was robust and diesel prices there were expensive, but the pull back in drilling activity there made diesel cheap and caused the economics of the facility to completely blow up. Shedding unprofitable assets like this will need to be a priority. A smaller company that generates profits is much more compelling than a larger one that is an endless money pit. It's going to take a lot of time and near perfect execution for Calumet to make this turnaround happen. Go has pointed the company in the right direction, now investors can wait and see if Calumet can get there. Calumet Specialty Products Partners' stock is still pretty radioactive right now. Even though the stock has declined 75% in the past 12 months, that doesn't mean the stock has hit a bottom. There is always the possibility that the company could fold under the pressure of its debt load. So investors shouldn't take this cheap price as a time to buy. If, and that's still a big if, Go can execute on the plan he has laid out, then perhaps this will be a stock worth revisiting in the future. After all, there is a steady, profitable business under all that mis-allocated capital over the past several years. So it will at least be worth watching to see if Calumet can turn its prospects around.